Elongated front portion of the head covered with many sensory hairs, which have a highly developed tactile and olfactory function. Somewhat curved, sharp pointy structure at the terminal end of the digits for digging in the earth. Portion of the hand facing outward to make digging easier and to push the earth aside more efficiently. Wide powerful articulated limb ending in a scoop-shaped paw allowing the mole to dig in the earth. Articulated limb with sharp claws that supports the mole while it digs in the earth. Terminal appendage of the body having tactile hairs that detect obstacles. Hair covering the body, mainly for maintaining internal body temperature and providing protection from insect bites. 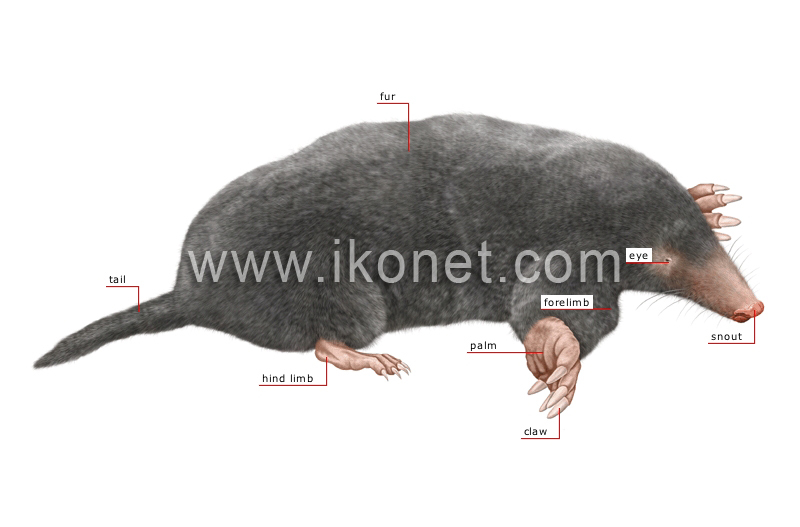 Organ of sight covered with hairs that can perceive variations in light intensity; some moles are almost blind.